‘Found Monochrome No. 19, Islington, London, 10.04.99,‘ by David Batchelor. There is something about Found Monochrome No. 19, Islington, London, 10.04.99 that I have always liked, but I have never been exactly sure why that is. There are a number of things about it. I didn’t have to travel far: it was literally on the street directly outside the studio I worked in at the time, a vaguely run-down residential street in north London. 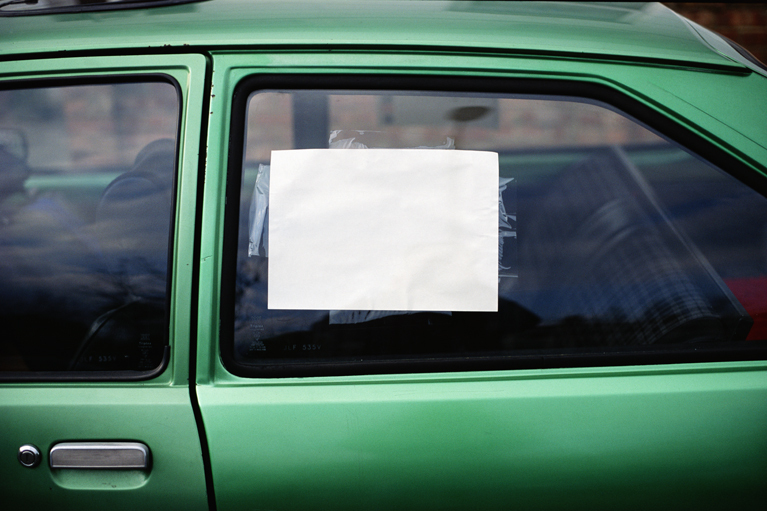 The car was an old Vauxhall Chevette and I assume the rectangle of paper taped to the inside of the rear window was a handwritten ‘for sale’ notice that had faded in the sunlight. Everything about the image is both commonplace and provisional: the car parked just where it was at the time, the homemade sign, the wrinkled and uneven Sellotape, the non-lightfast ink, the here-today-gone-tomorrow everydayness of an improvised urban event gone slightly wrong. In November 1997 I began talking photographs of blank white rectangular panels that I found in the streets around where I lived. At the time of writing, August 2012, I have shot just over five hundred such images. The majority were found in London, because that is where I spend most of my time, but I have come across others in town and cities – almost always towns and cities – elsewhere in England, Scotland, Continental Europe, North and South America, and Asia. A number of things have changed in the sixteen years between the first and the most recent photograph: for example analogue photography has almost entirely given way to digital media, although I continue to use film for this work. There are a few reasons for this: pure habit and my love of carousel slide shows being the main ones. The main change within the project however is that my reasons for starting out bear almost no resemblance to my reasons for continuing. I only ever intended to take four or five images of these things I called ‘found monochromes’, and I took them initially in order to disprove or at least question something Jeff Wall had claimed in a lecture on On Kawara and the monochrome. This argument I conducted mainly with myself ceased to have any part in my thinking after I took the first few images. These monochromes of the street are occasional, often inadvertent and always temporary. They are little heroic moments of blankness in an otherwise saturated visual landscape. It is an ambiguous blankness because rectangular planes of nothingness could also be seen as voids at the centre of the field of vision. As such they are like errors: a space where there shouldn’t be a space, an absence where there should be a presence. And, soon enough, these errors are corrected: removed, painted over, filled-in or tagged. So a monochrome usually has a short life-span; over a few days it comes into being and it passes away, usually unnoticed. I never know where or when a monochrome will occur, except that they usually crop up in more transitional neighbourhoods and generally don’t feature in the more carefully tended areas of a town or city. Looking back through the original transparencies I realise I remember nearly every occasion that I photographed – and each feels like an incident that was recorded as much as an object that existed. I have never thought of these works as photographically significant: if the monochrome is landscape, the photograph is landscape; if the monochrome is portrait, so is the photo. I simply frame the event, centre the monochrome, make sure it is parallel to the picture plane and leave enough space on each side. Each image is a document; the series as a whole is a narrative of visibly imperfect repetitions, and a map that indicates the locations of incidental things that are no longer there. For all its informality and contingency, No 19 is formally quite succinct. The white rectangle is framed and isolated by the largely dark interior of the car; there is a bit of depth in the space behind the glass; the chipped metallic green of the car body frames the event in an abstract kind of way. It is a simple picture of three surfaces, all of which require and sustain each other, and there is nothing else. The metal supports the glass that supports the paper. The paper behind the glass calls attention to the metal that it advertises, or fails to advertise: the intended relationship – the purposeful but entirely un-aesthetic placement of materials in relationship to one another – has come undone, has slowly dissolved, along with the ink that is no longer there. In doing so, it has become something else. A malfunction has become a monochrome. Posted on August 10, 2012 December 8, 2016 by vsmallfires	This entry was tagged David Batchelor, Found monochromes, Jeff Wall, On Kawara. Bookmark the permalink.